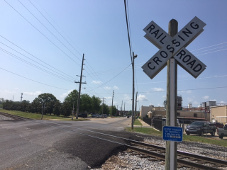 Anyone working in the area of railroad real estate is familiar with the conflicts that arise when utility companies seek access to railroad rights of way. It would be best for railroad business if railroads could completely avoid sharing their corridors with utilities. Yet, given the reality that railroads stretch north to south, east to west and every direction in between with miles of contiguous corridor, it is necessary for railroads to permit crossings for lines to bring power, gas, high speed internet and other utility necessities to the public. Recognizing this fact, the typical clash between the industries is not about whether utilities may locate in the railroad corridor but rather terms and conditions upon which the right to intersect will be granted. The primary complaint by utility companies is that obtaining railroad agreements is time consuming and expensive. Utility companies (and their contractors) question the cost of real estate fees, insurance and flagging. Contractors, in particular, have tight time schedules to meet and are frustrated when their time schedules are affected. On the other hand, railroads are highly sensitive to ensuring compliance with their procedures to protect railroad safety and operations. 2017 Annual Meeting Registration Open - Room Block Closes May 25! On Monday, June 19 we will begin our educational program and association business, and then finish the day with a riverboat cruise and reception aboard the Memphis Queen III. Guests of Annual Meeting attendees will also have the opportunity to participate in a tour of Elvis' Graceland mansion on Monday. On Tuesday, June 20, we will wrap up our educational program and association business, and welcome attendees and guests to the President's Dinner at the Peabody Hotel. On Wednesday, June 21 a farewell breakfast will be hosted in the morning. A draft program is available here. Annual Member attendees are encouraged to book a room in the ARDA block the Peabody Hotel at a discounted rate of $185 per night. Reservations may be made via this link, or by calling 1-800-PEABODY and requesting a room in the "American Railway Development Association Block." Our block will close on Thursday, May 25, so book your room today! Contribute to the 2017 Silent Auction! ARDA will once again be hosting a Silent Auction at the 2017 Annual Meeting. This year the Silent Auction will benefit the upcoming ARDA Sponsorship program, whose details will be announced at the Annual Meeting in Memphis. Donations in the past have included a number of different items, including railroad commemorative pieces, locomotive models, apparel, electronics and more. If you have any questions regarding the Silent Auction please contact Fred Oelsner at staff@amraildev.com for more information. The ARDA is pleased to welcome Mayor Jim Strickland of the City of Memphis and Mark Herbison from the Greater Memphis Chamber to speak about the impacts of the rail industry on their city and region. Norfolk Southern's Bruno Maestri, will speak on the state of the railroad industry in Washington, and the impact of the new Presidential Administration. Jason Reiner (NS), Jo Strang (ASLRRA), and Lisa Wilson (NS) will speak on the impacts of Postive Train Control on railroad real estate and economic development. Bernard Swiecki (Center for Automotive Research) will present on the impact of autonomous vehicles on the rail industry. John Fiorilla (Capehart Scatchard) and Malcolm Roop (NS) will do a presentation regarding the first railroad condemnation in New Jersey in 50 years. Bill L. Adams (TVA Economic Development) will present on TVA's InvestPrep program which is aimed at helping Valley communities market readied building and industrial sites. Dillon Magers and Stephanie Ortiz (BNSF) will speak about BNSF's work utilizing unmanned systems on projects related to environmental compliance. Mike Grim and Kelly Harris (NS) will discuss their combined efforts to locate and develop a major project in Mississippi. Jim Kvederas (CN), Nathan Perkins (NS), Rick Verkler (CN) will offer variety of perspectives (legal, public relations, government relations, information technology, and economic development) as part of a panel discussion on the benefits of ensuring environmental compliance on railroad projects. Ben Pylant (Halff Associates) and Leland Willis (UP) will speak on stormwater management issues. John Hoover (NS) will present on the work of the Modalgistics Group at NS and how they manage supply chain logistics. Second Vice President: Mark Holder, Bartlett & West, Inc. Thank you to all of our ARDA sponsors for your support!